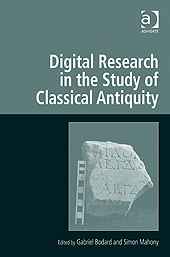 This book explores the challenges and opportunities presented to Classical scholarship by digital practice and resources. Drawing on the expertise of a community of scholars who use innovative methods and technologies, it shows that traditionally rigorous scholarship is as central to digital research as it is to mainstream Classical Studies. The chapters in this edited collection cover many subjects, including text and data markup, data management, network analysis, pedagogical theory and the Social and Semantic Web, illustrating the range of methods that enrich the many facets of the study of the ancient world. This volume exemplifies the collaborative and interdisciplinary nature that is at the heart of Classical Studies. Contents: Introduction, Simon Mahony and Gabriel Bodard; Part I Archaeology and Geography: Silchester Roman town: developing virtual research practice 1997–2008, Michael G. Fulford, Emma J. O’Riordan, Amanda Clarke and Michael Rains; Diversity and reuse of digital resources for ancient Mediterranean material culture, Sebastian Heath; Space as an artefact: a perspective on ‘neogeography’ from the digital humanities, Stuart Dunn. Part II Text and Language: Contextual epigraphy and XML: digital publication and its application to the study of inscribed funerary monuments, Charlotte Tupman; A virtual research environment for the study of documents and manuscripts, Alan K. Bowman, Charles V. Crowther, Ruth Kirkham and John Pybus. One era’s nonsense, another’s norm: diachronic study of Greek and the computer, Notis Toufexis. Part III Infrastructure and Disciplinary Issues: Digital infrastructure and the Homer multitext project, Neel Smith; Ktêma es aiei: digital permanence from an ancient perspective, Hugh A. Cayless; Creating a generative learning object (GLO): working in an ‘ill-structured’ environment and getting students to think, Eleanor O’Kell, Dejan Ljubojevic and Cary MacMahon; The digital classicist: disciplinary focus and interdisciplinary vision, Melissa Terras; Bibliography; Index.